We have been obsessed with spin art at our house lately. We hosted a painting party for my daughter's 2nd birthday and one of the activities was spin art using a salad spinner. 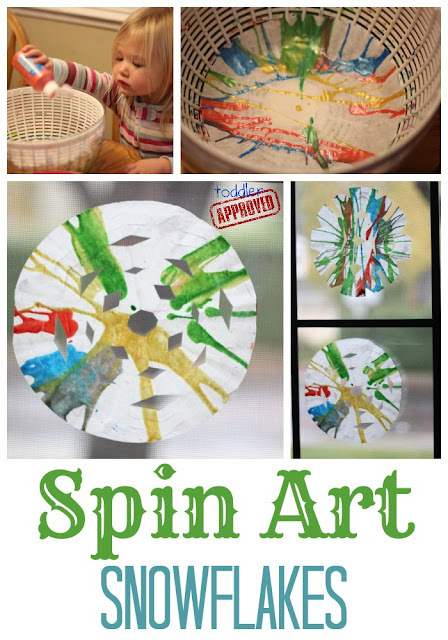 Ever since her party we have been making new spin art creations almost every day. Last week we decided to do some coffee filter spin art and then cut the coffee filters up to make spin art snowflakes. The project was simple and now our entire front window is covered with colorful snowflakes! Put the coffee filter into the bottom of the salad spinner and add in some paint. Spin and spin the salad spinner! 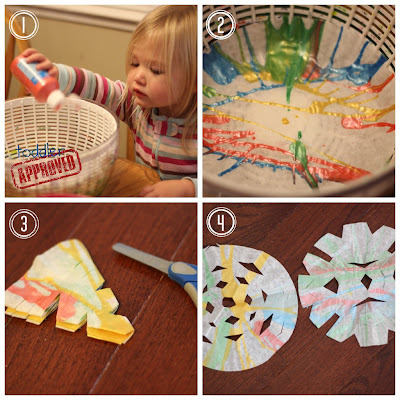 Fold up the coffee filters and make slits in the sides to create awesome and unique snowflakes. My toddler did a lot of the painting/spinning while my preschooler did the snowflake cutting. They made a great team. Stick the snowflakes on a window so that the sun can shine through and show off all the beautiful colors! *This activity was a fun way to talk about colors and shapes with my toddler. Have you done any other cool spin art crafts that you can share with us? I'm glad to try something new with my salad spinner since I barely use it for its intended use! These are so pretty! They look wonderful in the window! This is such a great idea! Now I wish I hadn't given my salad spinner away. I was just going to add that if you fold the filter in half and then into thirds, you'll end up with six sides like a real snowflake. :) your snowflakes are beautiful!